For applications that require a ton of outputs, this module is the one you're looking for. 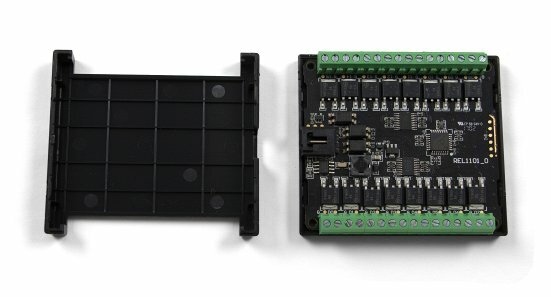 With sixteen PWM-enabled relay outputs, it can be used to control devices and switch circuits of up to 30V volts and 8 amps. LED strips, DC motors, power relays, fans and other small circuits are all common loads for this type of output. The REL1101 connects to a port on a VINT Hub. See the Connection & Compatibility tab for a list of hubs. 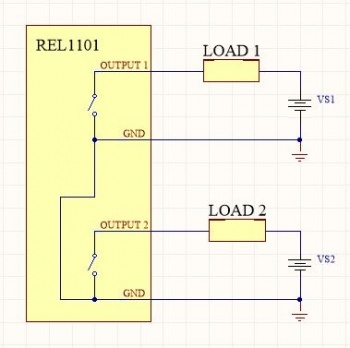 Instead of providing power to the device, a solid state relay output switches the circuit to ground and completes the circuit when you want to switch it on. The power is supplied externally and should be connected in series with the load and the relay output. Each channel has a ground terminal beside it to make wiring a snap, and each one leads to a common ground. In addition to switching at microsecond speeds, each relay output is also capable of pulse-width modulation; rather than simply switching on or off, you can select a percentage duty cycle to limit the power being supplied to a specific level. 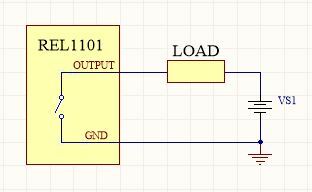 This allows you to control devices like a dimmer would, which is an important feature for LEDs, fans, and motors. Check the datasheet for your device to ensure that it is designed to be used with PWM (some devices such as incandescent or CF bulbs are not designed for dimming). The VINT port on this board is electrically isolated from the rest of the board, improving stability by eliminating ground loops. 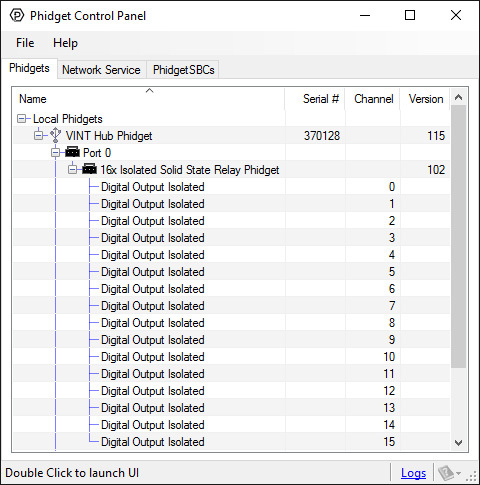 Connect the REL1101 to the VINT Hub using the Phidget cable. Connect the circuit to one of the relay terminals. Now that you have everything together, let's start using the REL1101! 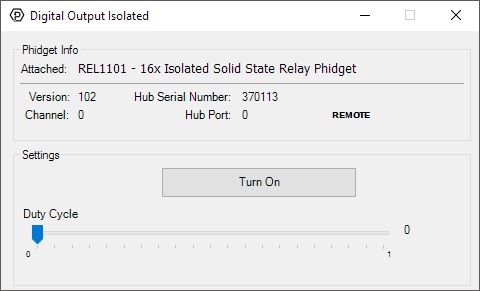 In order to demonstrate the functionality of the REL1101, the Phidget Control Panel running on a Windows machine will be used. Linux users can follow the getting started with Linux guide and continue reading here for more information about the REL1101. The RELL1101 outputs behave similarly to a solid state relay - by toggling the state of the output, you can switch a circuit on and off. Specifically, changing the output state will switch a connection between the output and ground terminals. The outputs are also PWM-enabled, which means they can vary the intensity of the output by setting a percentage duty-cycle. To switch a load with the REL1101, connect the load and power supply to any pair of output and ground terminals, as pictured to the right. The load could be a larger relay, a solenoid, LEDs, light bulbs, motors, etc. 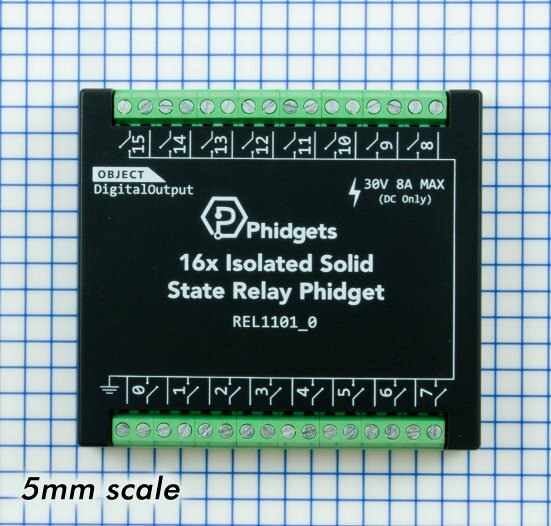 Check the specification table on the product page for your Phidget to ensure that the voltage or current required by your load does not exceed the maximum. Multiple circuits with multiple supplies may be controlled by the REL1101 at the same time. Just be aware the grounds of all switched circuits will be shared, as all ground terminals on the REL1101 are connected internally. 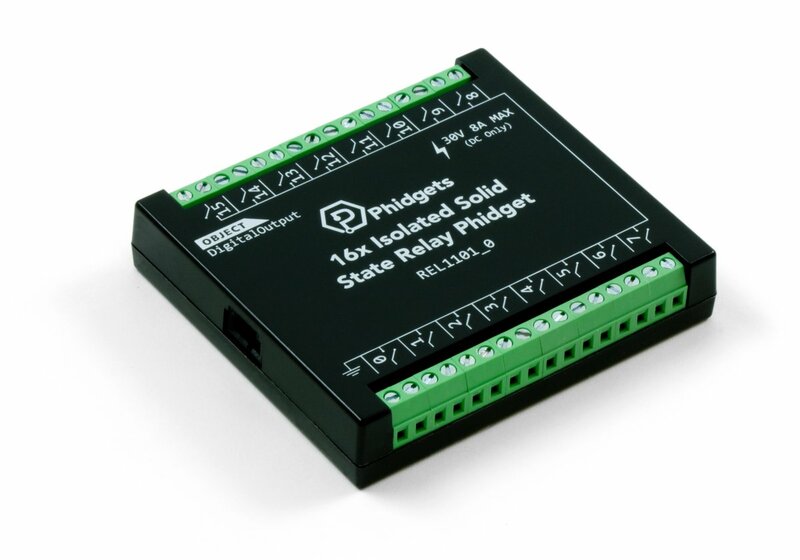 The Isolated Solid State Relay Phidget is capable of switching loads of up to 240W. However, for power higher than 50W, you'll need some form of cooling to keep the heat of the transistors down at normal levels. 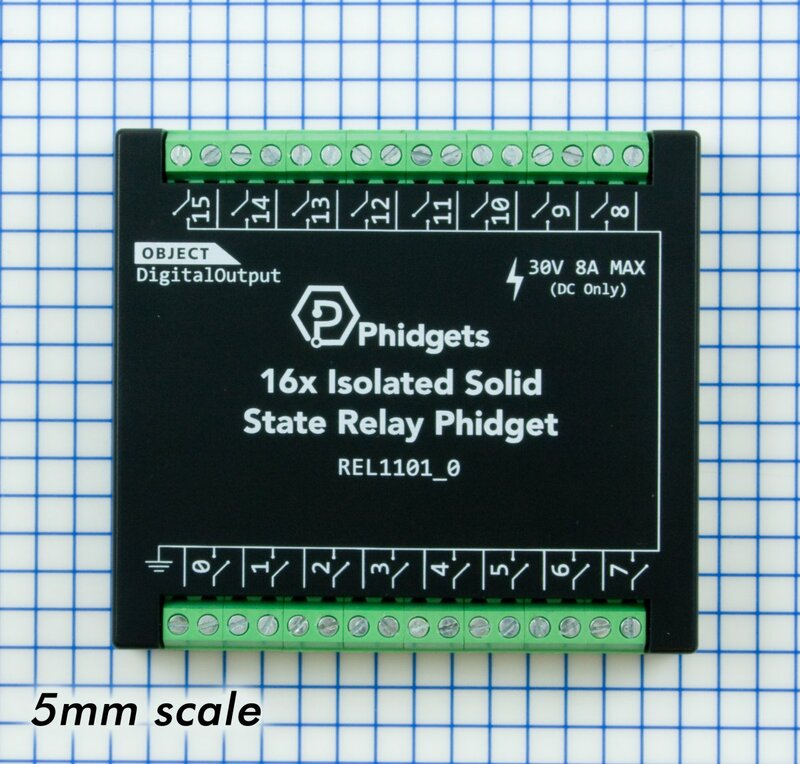 This Phidget's strengths lie in its multiple, high switching speed outputs. For high power projects, a hockey puck type SSR may be a better choice. * Note: At switching powers powers higher than 50W, external cooling may be required. For high power applications, a hockey-puck style SSR may be more appropriate. See the "Other Relays" tab for more details.